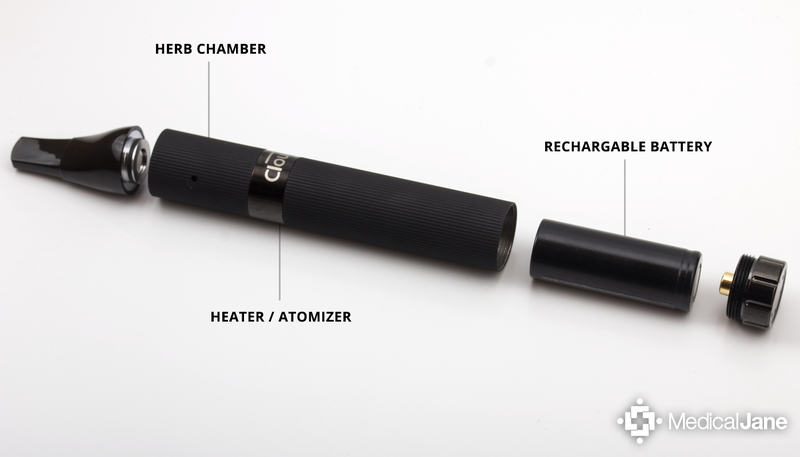 The Phantom is the new portable vaporizer from Cloud V, who is probably best known for their concentrate pens. The Phantom also has a nice weight to it, which makes the unit seem more substantial and well built than competing manufacturers offerings in the same price range (100-$150). Lets see how it performs. Compared to most other portables at the price point, the Phantom actually looks really great right out of the box. It’s got a nice weight to it and feels like it has better overall build quality than the G Pro or K-Vape. With that said, it is a bit bigger, so it’s not quite as portable as the aforementioned units. However, I really like the Phantom’s rubber side grips and ‘reed’ type mouthpiece. Aesthetically, I’m a fan. The Phantom operates differently than most other portables I’ve used. While most units either come with a few preset temperature settings, or give you the ability to set temperature precisely between a certain range, the Phantom only has one preset temperature setting – 428°F. While some people won’t mind the lack of options here, others (like myself) will find it strange, especially because it runs so hot. I typically prefer to vape around 385°F, being sure to stay well below the point of combustion. However, the Phantom operates at or above that level, which worries me. One I began vaping, I realized that my suspicions were correct. The vapor produced by the Phantom is just way too hot and harsh for my liking. This is a real shame, because I actually really like every other aspect of this unit. To its credit, the Phantom does put out some good sized clouds, which makes sense because operating at such a high temperature means there’s for sure a decent amount of smoke in those vapor clouds. Again, bummer. Another thing that irked me a bit was the 2 minute auto-shutoff feature in conjunction with dim display lights. Once the Phantom reaches its optimal temperature, the red lights turns to blue. After 2 minutes, the blue light and the vaporizer turn off. If you happen to be vaping outdoors in the sun or in a brightly lit room, it can be hard to tell if the blue light is on or off. I found myself constantly having to look at the display lights to see if the unit was still on. This is a big plus, as many vape enthusiasts will agree that battery failure is one of the more frustrating issues you can encounter, as more often than not the battery is built into the unit and is not replaceable. Batteries also don’t seem to covered nearly as long under warranty as heating elements or electronics. The Phantom’s removable tail-cap makes changing out it’s rechargeable 18500 batteries completely painless. Gone are the days of having to replace your entire unit or having to deal with warranty claims when a battery issue rears its ugly head. When compared to other units in the same price range, the Phantom all of a sudden doesn’t look so bad. I’d place it in the same category as the G Pro and that whole extensive family of Chinese knockoffs. I actually think the Phantom has a way cooler design and better overall build quality. However, the Phantom’s single heat setting is too big of a character flaw to ignore. If you typically turn your vape all the way up, then you might actually really like this unit. However, if you prefer to vape on lower settings, and like having the option to choose between a few different temperatures, the Phantom isn’t for you. If you’re keen on the Phantom and want to see what it’s all about, you can purchase one from this trusted retailer. Overall, the Phantom is very average. Definitely not he best portable vaporizer I’ve ever used, but certainly not the worst either. If you don’t mind the single heat setting that runs a bit hot, then the Phantom is actually a decent option for the price.